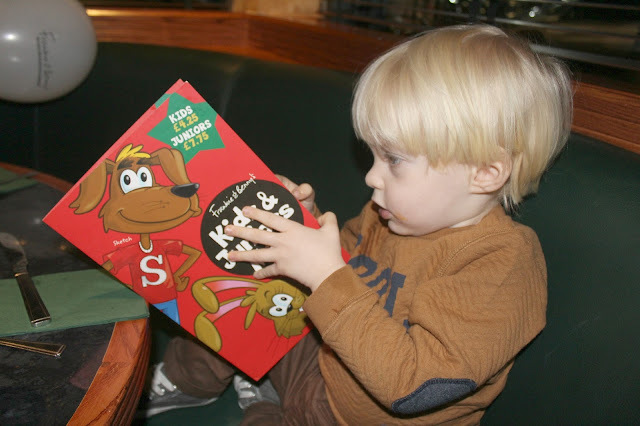 We were recently invited along to our local Frankie & Benny's to try out their new Autumn/Winter menu - I've enjoyed eating at Frankie & Bennys for quite a while now but had never experienced dining there with kids before so I was intrigued to see how their kids menu and service measured up. 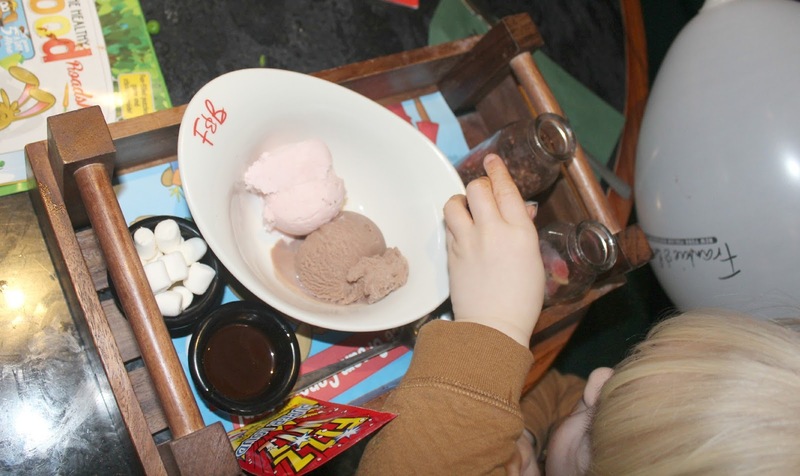 The waiting staff were very attentive, and made a big fuss of both Tyne & Noah - our table was ready for us when we arrived, and was set up with balloons which immediately made Tyne's day! The waitress asked if we wanted any appetisers while we browsed the menu so we ordered some Garlic dough balls, which were delicious! The kids menu offered plenty of choice - Tyne decided to go for the cheese and tomato pizza with chips and peas (£4.25) - the menu had some nice choices including spaghetti bolognese, penne pasta, sausage and mash, chicken bites, fishfingers and cheeseburger. We found the dough balls quite filling so we didn't order any starters, and went straight for the mains instead. 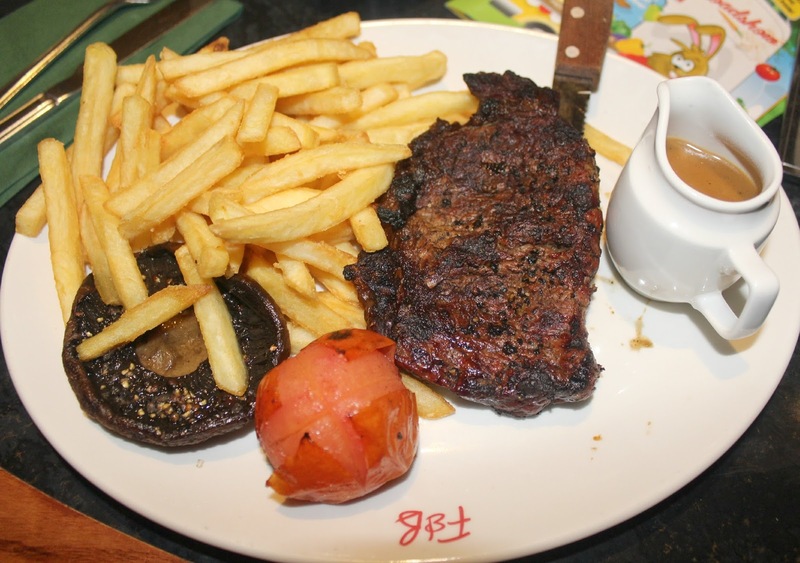 I ordered the 8 oz sirloin steak with peppercorn sauce (£16.95) - the waitress warned there would be a short wait for the steak and asked if we wanted Tyne's dinner brought out ahead of ours, which we agreed to. Tyne's dinner arrived about 20 minutes before our food, which was great as it meant he wasn't waiting around but it did mean he had already finished by the time our meals arrived which was a bit of a pain but we had been warned. 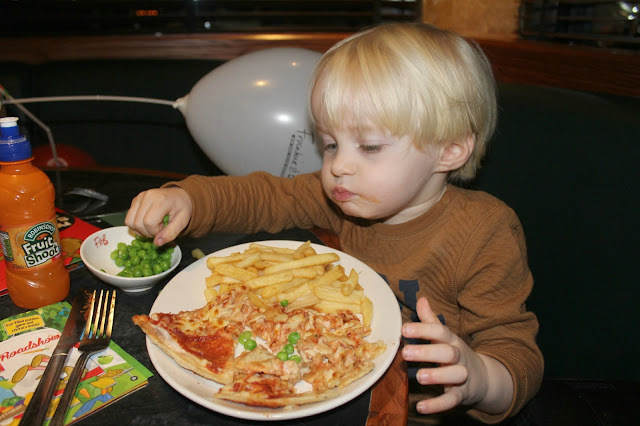 Tyne absolutely devoured his pizza, chips and peas and seemed to thoroughly enjoy it! When my steak arrived it was cooked perfectly, very tender and with no fat or gristle in sight - the peppercorn sauce was a perfect accompaniment! My only minor complaint was that the menu stated it was served with onion rings but there weren't any served with it, which was a bit of a pain as I'd have ordered them on the side if I'd known. 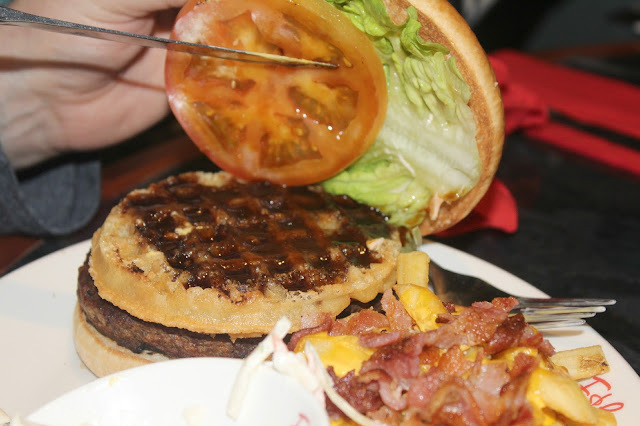 Jon ordered the Manhattan waffle burger (£11.95) - which is listed as a classic beef burger topped with an American style waffle and bbq sauce - he ordered it with cheese & bacon fries which he said were amazing! It also came with salad on the burger, and a side serving of slaw. 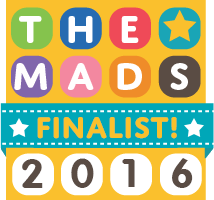 Jon really enjoyed his meal - I wasn't too sure about the addition of a waffle to a burger but he assured me it was a perfect combination so I tried a little and I have to agree - the waffle added a lovely crunch to the burger, unusual but delicious! We all really enjoyed our mains, but still had room for dessert. 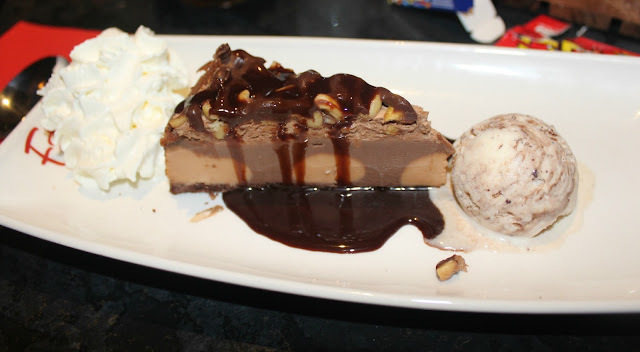 I tried the Peanut Butter Cheesecake (£5.95) on the recommendation of the waitress and it didn't disappoint! It was served with a lovely peanut butter ice cream, and the flavouring of the cheesecake was perfect - not too overwhelming but not disappointing either. 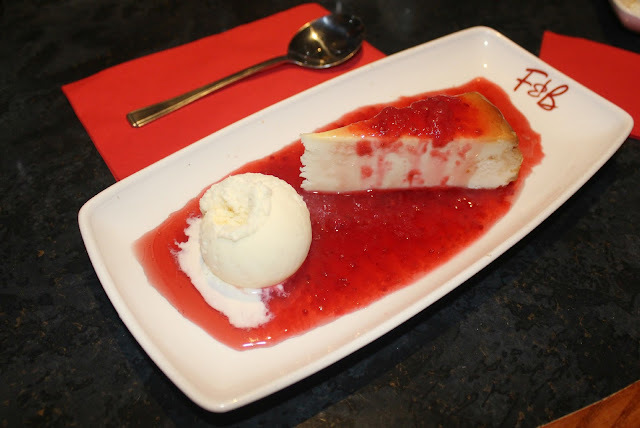 Jon ordered the vanilla cheesecake (£5.45) which looked really lovely, his only complaint was that it was served with rather a lot of red berry sauce whereas he would have preferred just a drizzle. Tyne's dessert looked amazing, the photo doesn't do it justice at all - he ordered the Ice Cream Candy Shop (£1.95 extra) which was a crate containing 3 milk bottles filled with sweets (Jelly tots, smarties and chocolate covered raisins) , a packet of Fizz Whizz sherbert, marshmallows, dipping chocolate and 2 scoops of ice cream - amazing! He was absolutely delighted with his choice and ate every last bit! 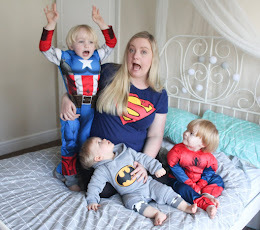 The service was attentive throughout our meal, and I loved the fact that there organic baby foods available if we had needed to feed Noah during our visit - I really think more restaurants should offer this service! 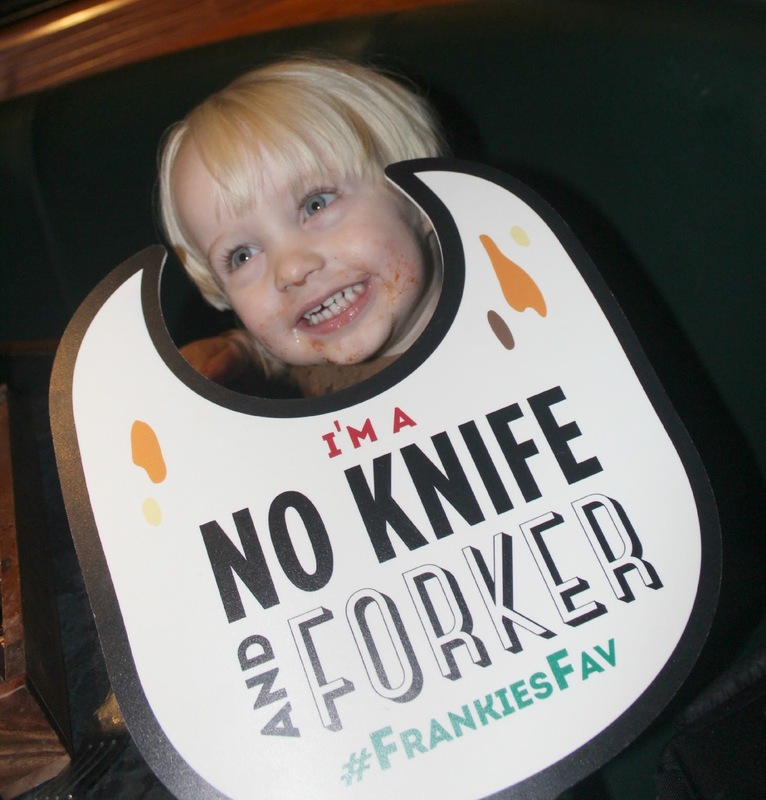 All in all we really enjoyed our meal and the dining experience, and would certainly come back to eat at Frankie & Benny's again. I've never heard of a waffle burger! That's Interesting! The food looks delish and so does the dessert! Looks like the kids enjoyed themselves. Have a great week!